Care to peruse completed maps? Take a stroll through the Atlas. The bridge from Miss - Louis. was placed there so that it was crystal clear that the two can attack each other (per suggestion by someone earlier in the thread). To put an attack from Ark - Miss would almost remove any reason for even having the river extend that far, but, to keep the topography realistic, the River needs to remain. The gameplay as it it drawn now should be good though. It gives ample crossings without connecting too many states across rivers. To me, one of the strong-suits of this board is that it's not one in which players will be able to develop a gameplan at the beginning and just stick to it... With 13 ways of getting bonuses, a unique grouping of "continents" (including bonuses for both fleets), combined with somewhat restricted attacks across the rivers, it should provide the kind of dynamic that keeps players on their toes and having to continuously re-evaluate their tactics. in short, I don't think this will be the kind of map where anyone will take complete charge from the very start. Elijah_S...I have asked Andy to look over your maps in readiness for FF. As a small point....if you want to have the bridge in Louisiana, then perhaps do a swap between the name and current bridge positions. It would make more sense to use that bridge to get from one side of the Mississippi to the other. Join Go Big Or Go Home- the ultimate 8 player doodle Assassin tournament EVER! After placing the boxes around the legends I decided to take a minimalist approach to the entire map. -Both flags have been removed from all ocean areas, giving the map a much crisper look.... I placed them both behind the title. -The ocean areas have been reworked to expand the blues up to the legend and map borders. -The bugle has been removed. -I messed around with my signature a little. I think this version is the best yet and am patiently awaiting for Andy to drop in and see what it will take to move this into FF. Thanks to Coleman and cairnswk for their help and giving the thumbs up to move this into Final Forge! Why do some borders look pixely and others don't? The northern border of texas, for example? You may want to go back and restroke your borders. Look out, the teacher in me is about going to nit-pick the legend; I'm not sure if it's grammatically correct to say "Hold All (...) Navy." Is "navy" plural as well as singular? Perhaps it is, and regardless there may be no better way to get the point across. And while I understand the need to add "added to other bonuses" under the states bonus, "added" confused me at first. What if said "in addition to other bonuses"? It seems a bit odd that St. Louis would be considered a major city on the map yet it doesn't have a river crossing, but I guess the Eads hadn't been built yet so historically it works. Pretend I didn't bring it up. As for "added" or "in addition" hmmm... have to think about that one. St. Louis not having a crossing was more a gameplay element than trying for historical accuracy... I wanted to somewhat balance out the bonuses. The Union States and Navy get higher bonuses that the South, so the idea there was to make it a little harder for players to gain the +2 for the Key Northern City bonus. As for the river crossings, I'm still very flexible in where they should be placed. I just don't want too many of them, as that would seem to negate the reasons for having them in the first place. I'm not sure if it's my eyes either, as Missouri and Penn. seem to be different sizes. I'm glad you're working on the borders, it's just something you'll have to keep playing with. The river still looks a little odd to me, perhaps it's the glow around it in some areas? (Like near Illinois and also East of there.) I think what's throwing me off may be that the ocean water looks and feels active, while the river feels flat, you know? And for the sake of creativity, would you consider altering how the bridge between Iowa and Illinois looks? Just so we can have 3 different bridges on the map, instead of two copies of the same. But this is just a minor idea. The boats are looking much better, but they seem like they are "placed" on top of the water (and the land in some parts)...I don't know if this was intentional or not. If it wasn't, I'd consider making them look like they are in the water. I like what you've done with the legend, I don't think there is much more I need to say about it...though I'd maybe alter the color of the blue/cyan line border. That's all I've got for now! AndyDufresne wrote: [*]The boats are looking much better, but they seem like they are "placed" on top of the water (and the land in some parts)...I don't know if this was intentional or not. If it wasn't, I'd consider making them look like they are in the water. Am i looking at the ships wrong, or is it a top view of the southern ships and a side view of the Union ships? It screws up the perspective for me, as does having the Confederate ships beached. I really like the style of the northern ships, and it'd be nice if they matched. I'm behind you on the bonus for the two navies... Union ships should be worth more, especially since they can't attack the land directly. Wait, does the Monitor attack Virginia, or is that a one way attack route? The line and the note in the legend are contradictory. oaktown wrote: Am i looking at the ships wrong, or is it a top view of the southern ships and a side view of the Union ships? It screws up the perspective for me, as does having the Confederate ships beached. I really like the style of the northern ships, and it'd be nice if they matched. I think that is also what is messing with my mind. Lets see if we can get some uniformity among the ships...in regards to perspective...and watch out for the beaching as Oaktown noted. The Conf ships all touch land. -This is a gameplay issue. 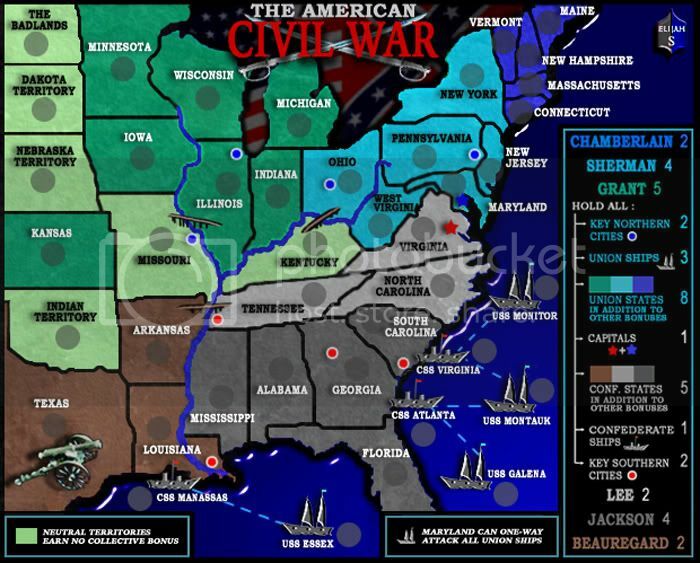 With all Union ships able to be attacked by Maryland, "ownership" of the southern ships was acheived by having them all touch southern states. As for the perspective... I think it gives the board depth having a side view of the union ships and an upper-angled view of the southern ships. There's no line from the Monitor to Virginia, but it can attack the CSS Virginia. Last edited by Elijah S on Mon Nov 05, 2007 4:09 pm, edited 1 time in total. This is the newest version... as of Nov 5th. -The confederate ships have been redrawn to have the same perspective of the Union ships. -Pixelation has been addressed (especially between Texas and Oklahoma, around Missouri, around West Virginia and between Kentucky and Tennessee. -A third bridge has been made and placed between Ark - Miss. -A faint texture has been placed on the flags. -The attack line between the USS Monitor and Maryland has been removed. -My signature/logo has been redone. -I tried other colors as borders around the legends, but nothing seemed to look as good. -Removing the drop-shadows from the ships only flattened the ocean, so I've left them there to help give a sence of depth. I think this pretty much addresses recent input. Location: Pennsylvania, U.S.A, North America, Earth, Milky Way, Universe. they're stylized... I like them. Like something that the Franklin Mint would stamp a "limited number" of and sell to lonely drunk people on late night television. The canon now has to be two-dimensional as well. The ships look great, they appeal to the map. I really don't see how anyone can find much criticism about this map anymore. Elijah has addressed every constructive suggestion requested and this is a hell of a map and I as well as many other conquerclubbers are ready to see it put into play. Could we see both the large map and the small map, Elijah? The hope is that this will eliminate criticism AFTER you are quenched. This is a pretty straight-forward map with few gimmicks. A variation of the Classic Board, the main differences being: Maryland can one-way attack the Union Ships; Holding all Neutral States does not gain a bonus; and there are 13 ways to gain bonus armies, including a bonus for owning all Key Northern or Southern Cities and a bonus for owning all Union or Conferate States. The layout and structuring of bonuses should promote North vs. South gameplay. -The small map is 600px wide and 483px high. -The large map is 700px wide and 563px high. -2 groupings of "Key Cities"
-A slight change in the alignment of the Generals in the Legend. -River Crossings have been moved and placed beside St. Louis and Memphis. -The army circles for the ships and the dark blue (Chamberlain) states have been changed to provide better clarity of the army numbers. Warning: You may be reading a really old topic. -The small map is 600px wide and 484px high. -The large map is 700px wide and 565px high. -The borders around the legends are now different colors. -The borders between the states have been blurred slightly to help with pixelation. -The drop shadows have been removed from the Capitals and Key Cities. -The contents of the main Legend has been reduced in size, providing a little more space around the perimeter. I know, it's been a while. Andy has been out of town. He'll likely get to this shortly after he's fully settled in again, which I hope will be today. 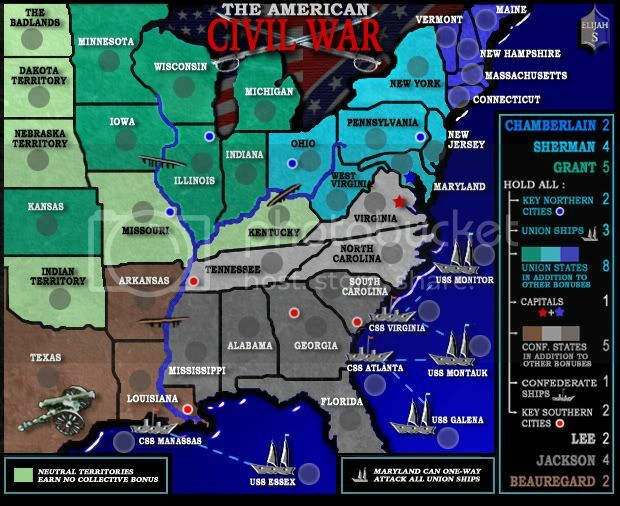 ---The American Civil War Map has reached the ‘Final Forge’ Stage. I've revived this thread from the pits of the Foundry furnace and have exmined the contents. Nearly every major concern has been addressed. If there are any other current concerns, please make your voice heard. If after a reasonable amount of time there has not been any objection or protest, the map will be deemed finished with the 'Foundry Brand' of approval and will be submitted for live play. As long as there is still discussion or posts that have yet to be commented on, the map will remain in Final Forge until said discussion has reached the conclusion that the map has reached its final and polished version. Post questions and concerns if any. Coleman wrote: He'll likely get to this shortly after he's fully settled in again, which I hope will be today.